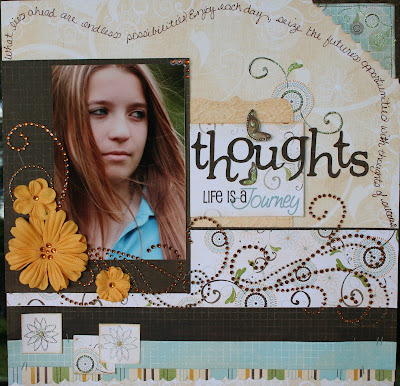 Finally, new scrapbooking layouts. During the retreat I was actually able to get three done, totally happy about this. 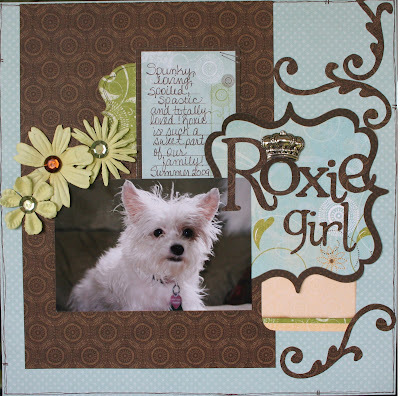 I haven't had the time to scrapbook lately and it felt nice to get back into the swing of things. I think the inspiration came from attending CHA and having a few new sheets of Bo Bunny to work with. I absolutely love this new line. Can't wait to get the store opened and get this product in. I think I will be getting at least two sheets of all of it. Love it. 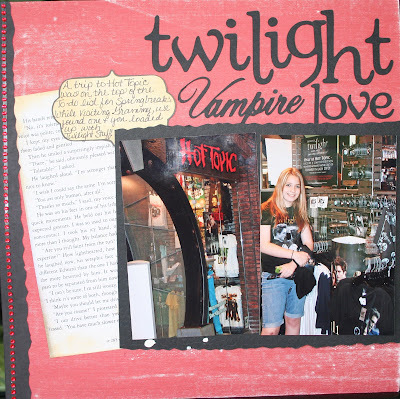 I was also able to scrapbook pictures of Bre visiting the Hot Topic store while we where on spring break, WE love getting to go to this store as we do not have one in Ocala. So much Twilight goodness, ahh. Anyway hope you enjoy. Mom, these pages are amazing. OMG...these layouts are incredible! You are so talented girl! Also...(i am blushing btw) thank you SO SO much for the little shoutout...you are way too kind! :) Honestly, one of my dreams is to meet all my blog friends one day. Thank you sweetheart!